It’s always a good feeling to finish the year and a sewing project at the same time. 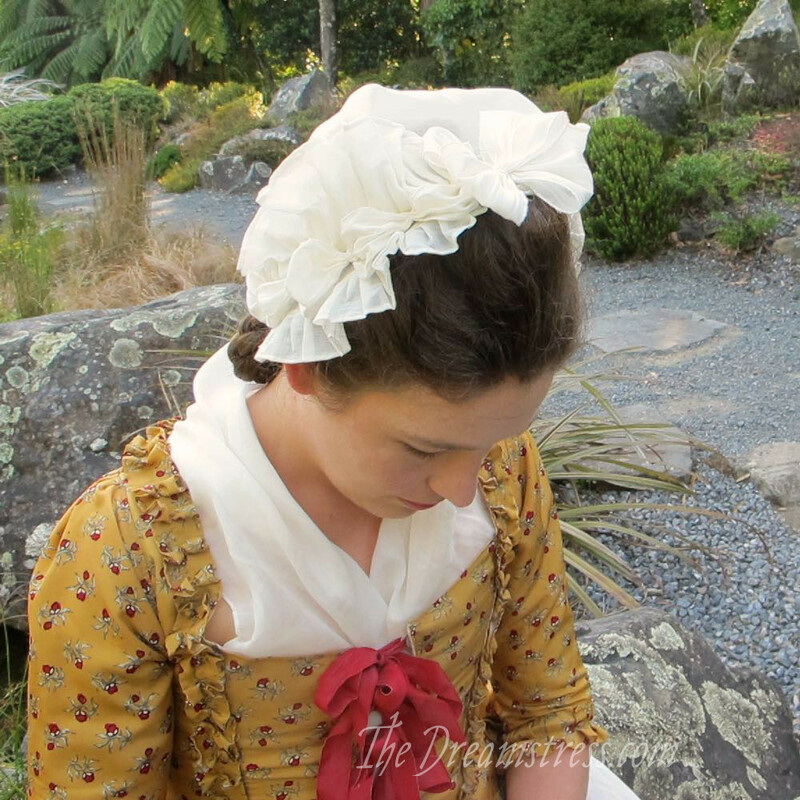 This time I finished the 1780s cap from the American Duchess Guide to 18th Century Dressmaking just as 2017 closed. 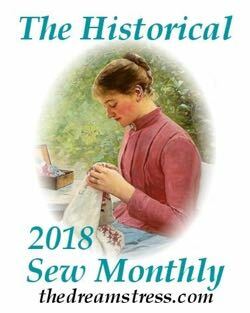 I was sitting on my couch sewing on the bow and watching bonnet movies as the year ticked over, because that’s how I party! 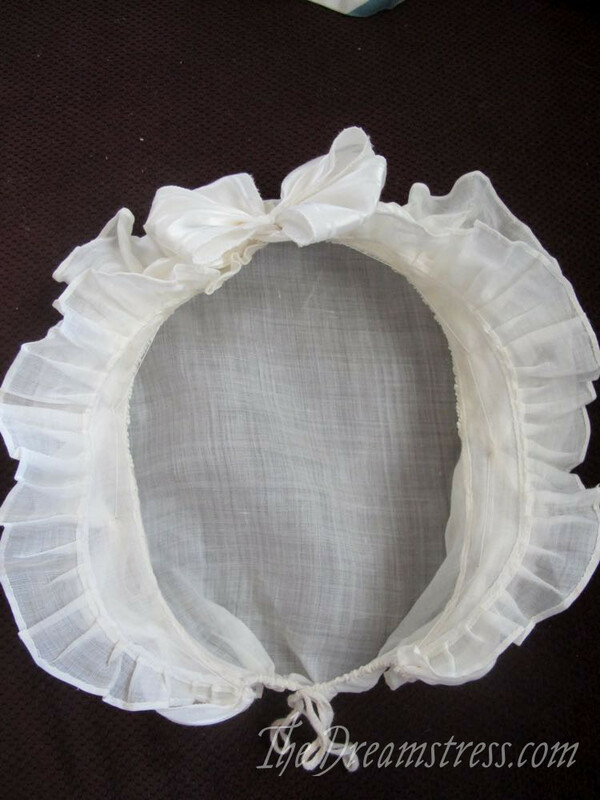 As far as I know, I’m the first person to have made the 1780s cap, which means I had the dubious distinction of discovering the typo where it says to cut one piece instead of two for the both the ruffles. I should have figured out the typo on my own. Two makes so much sense! But I was pattern testing for Scroop Patterns at the same time. The cap was my ‘down’ time from pattern testing, but my brain was 100% in pattern testing mode. That means I turn off independent thought and logic and follow what a pattern says exactly. 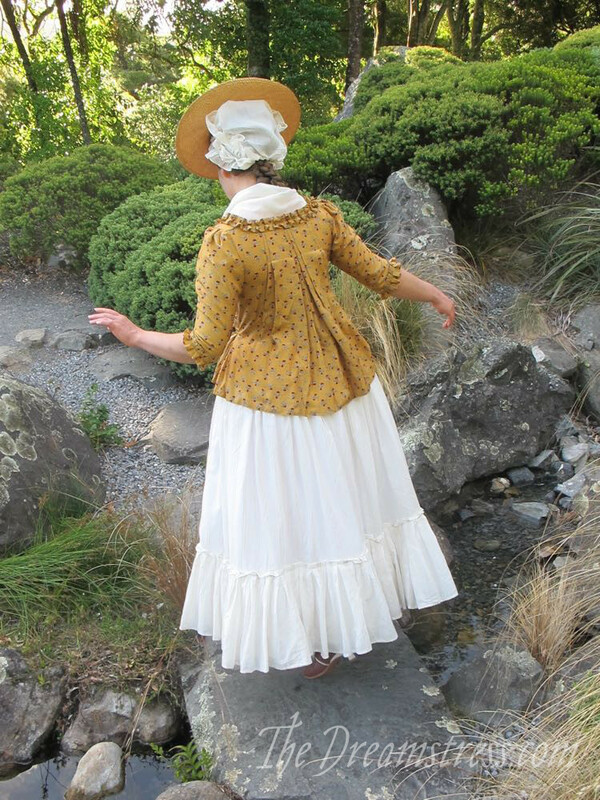 And I really wanted to do the patterns as AD gave them, rather than muddying the waters with what I know about 18th c sewing. So I got completely flummoxed when things didn’t match up. Luckily American Duchess has the best customer service, so when I left a note asking what I was doing wrong I got an answer within 20 minutes. Fixing the problem did take a wee bit of unpicking. I was also gutted to realise I had to hem yet more ruffle pieces (so much hemming), but it didn’t take me long to get back on track. 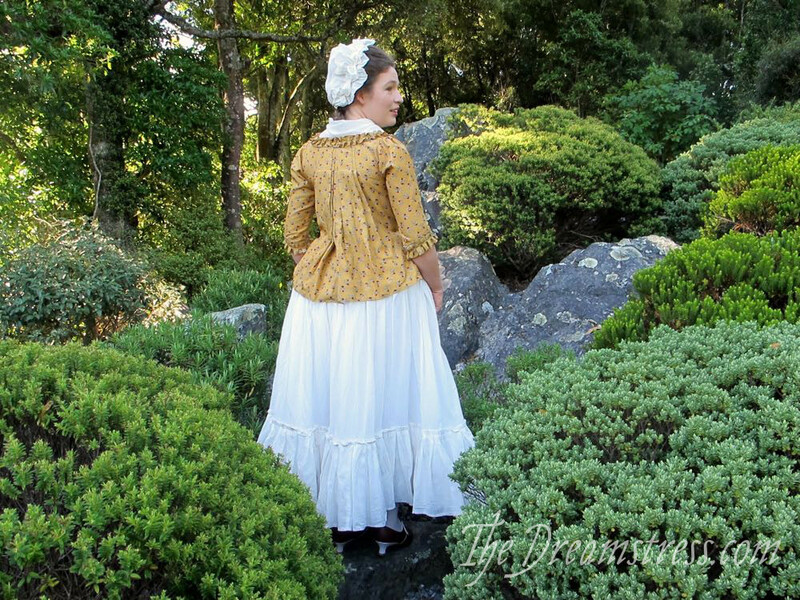 Ironically, I’d picked the 1780s cap to start with because it looked like it had less pieces to hem, with only 1 each of the ruffles. Ah well, that means the 1770s one will be easier! With the right pattern pieces, the instructions in the book are totally followable. If you take care and follow them properly you’ll end up with a gorgeous cap. I’m thrilled with the end result. I’m also hooked on cap making. So useful! So nice and small, so you can always have a few pieces of one with you to sew! I do have SO many questions though. Not ‘I’ve tried and tried, but the instructions are totally confusing me, can you clarify X” questions. I think those are fair to ask the authors (once you’ve made a VERY good effort of looking for the info elsewhere and seeing if they have blogged about it! 😉 ). 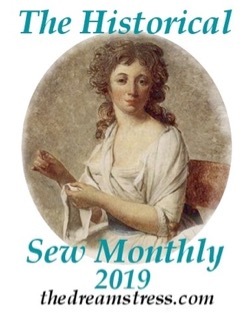 More like: “X stitch is used here, but are there any examples with Y stitch?” The kind of questions you could ask in a class. The book has provided just enough information to whet my appetite! 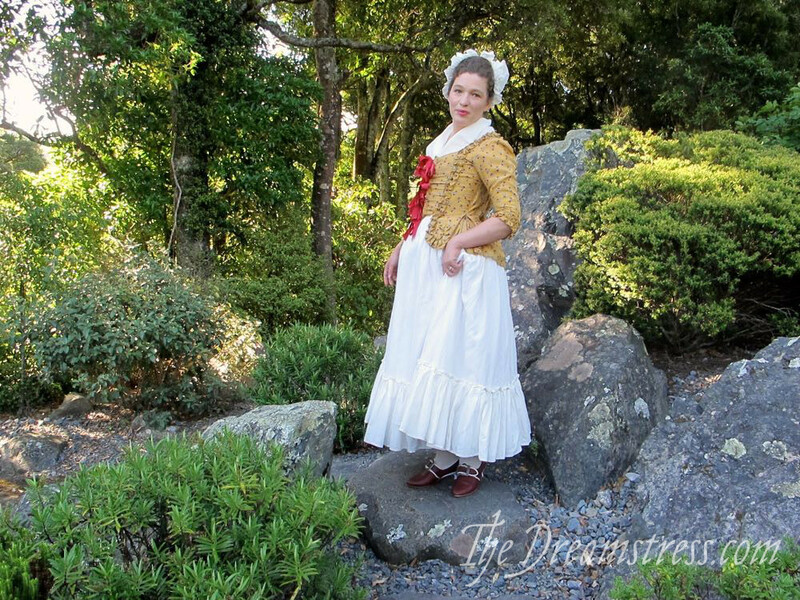 If I ever get a chance to take a Burnley & Trowbridge workshop (a girl can dream) I am SO there! So the book is great, but no substitute for a class, and getting to pick the brains of an expert. I do wish the book spent a little more time telling you how to put the cap on, and explaining how the drawstring works / helps the fit. 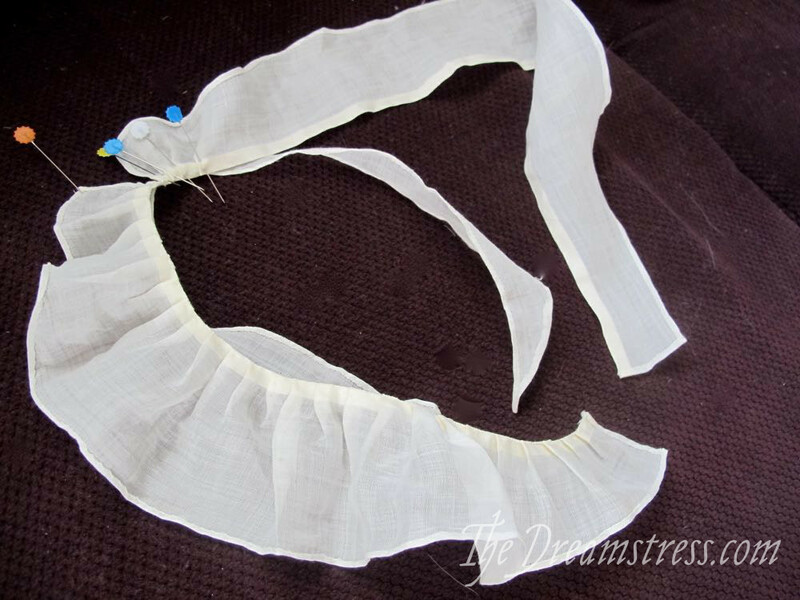 These do seem a bit trickier than putting an apron on, or making a neck ruffle, both of which are explained in detail. I really enjoyed making it, but man this cap was A LOT of work. So much tiny, tiny handsewing. I’m now looking at the caps in Virgil’s Fine Goods and thinking that the prices are EXTREMELY reasonable for the work! 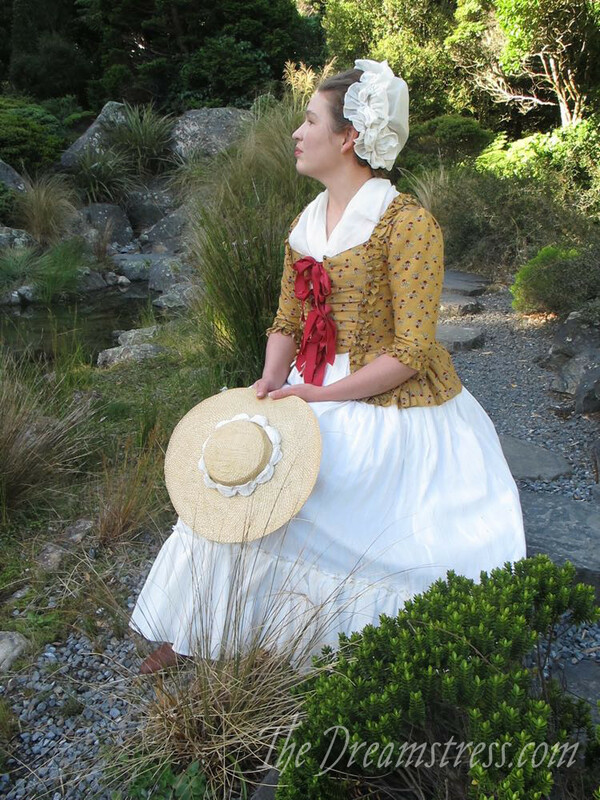 To finish my cap, I looked at lots and lots of images of caps in 1770s & 1780s paintings and fashion plates. 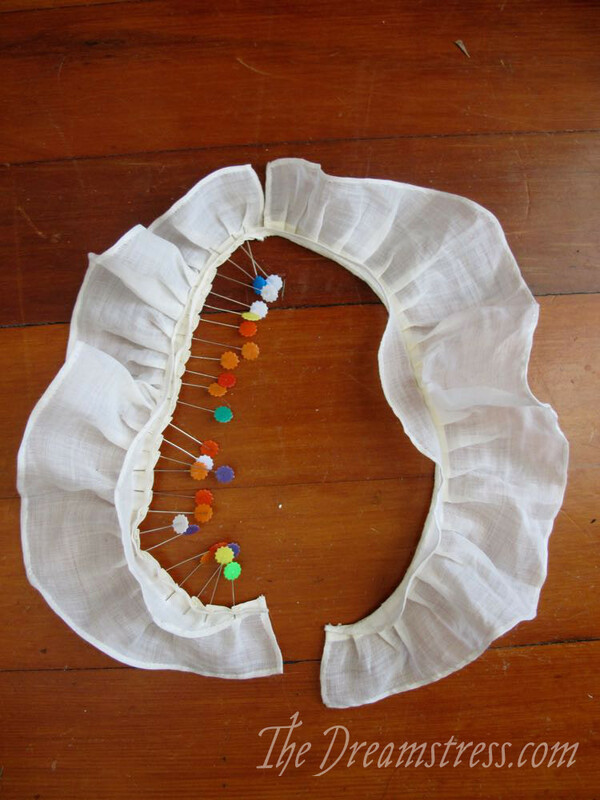 In almost all examples the ribbon on the cap either matches the ribbons on the garment, or is white. I didn’t have suitable silk ribbon in either colour. 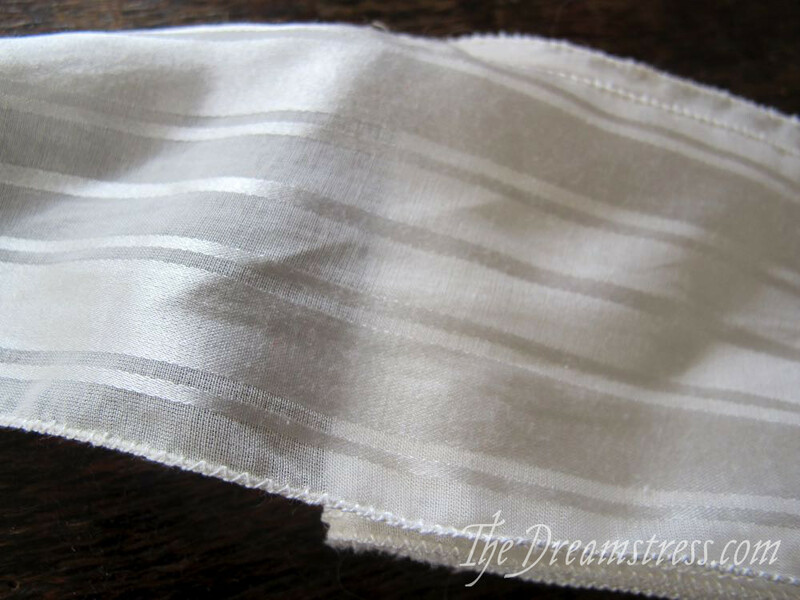 This lovely silk-cotton with satin stripes has been in my stash for ages. Striped ribbons are shown in lots of 18th c paintings. 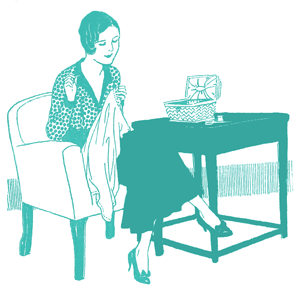 To make mine, I just finished the edges with a very narrow sewing machine zig-zag stitch. I am 100% ok with that as a historical compromise. It’s so difficult to find modern silk ribbon that matches the hand of period examples. In my mind a length of ribbon with the right hand is a length of ribbon with the right hand. Doesn’t matter if the edges were woven in or finished by your truly. 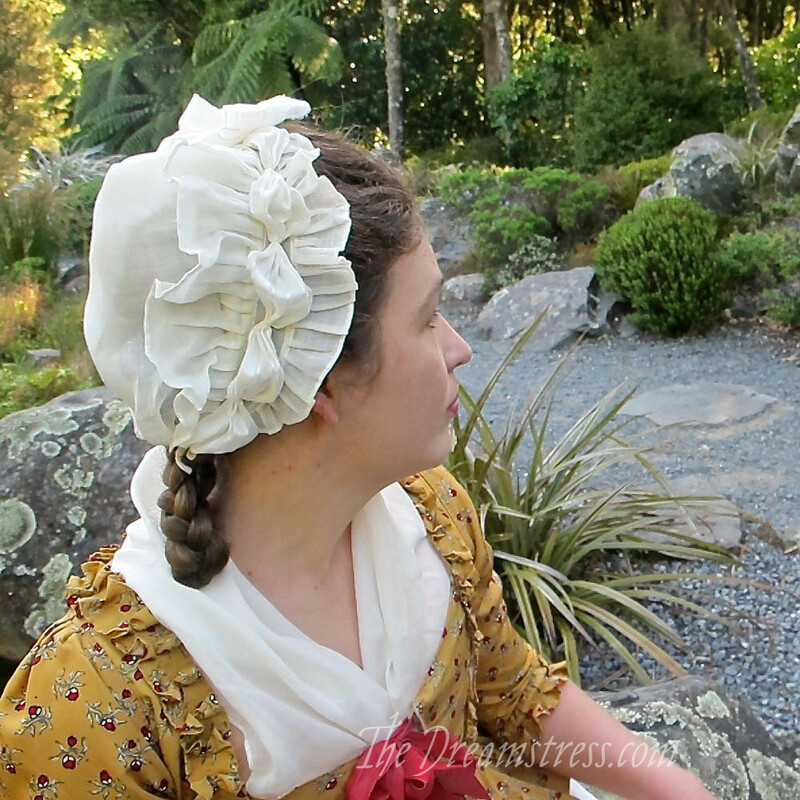 I celebrated my new 1780s cap by taking photos with it and my yellow silk pet-en-l’aire. 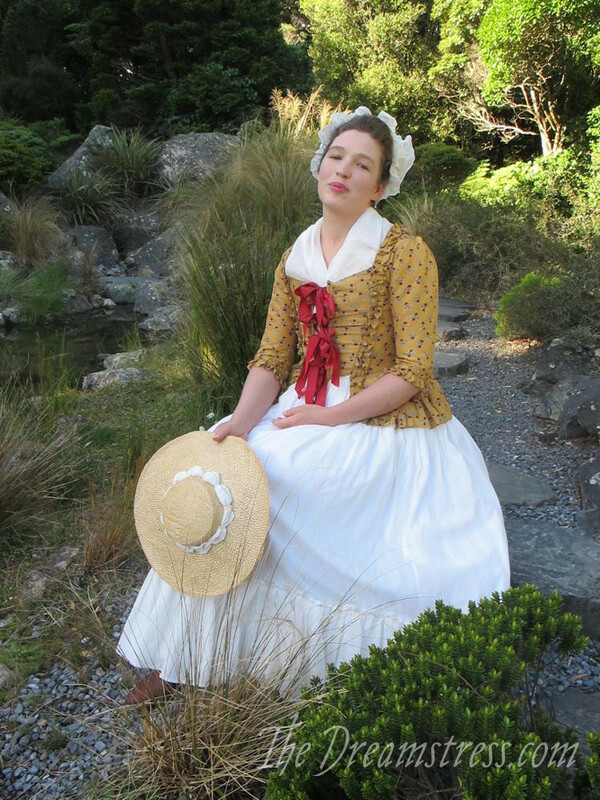 I wore the outfit with a newly made neckerchief of the same linen voile, and my exciting new American Duchess red & white Dunmores. And the cap and nreckerchief are the perfect finishing touches for the outfit! I love your zig-zagged ribbon. Just wanted to share. Have a wonderful rest of your weekend! 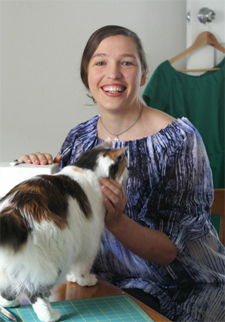 Happy sewing, everyone! So pretty! The cap, and the entire outfit. P.S. Apologies in advance if there are two comments from me, and feel free to ignore this one! The first resulted in an error message. It looks SO CUTE! 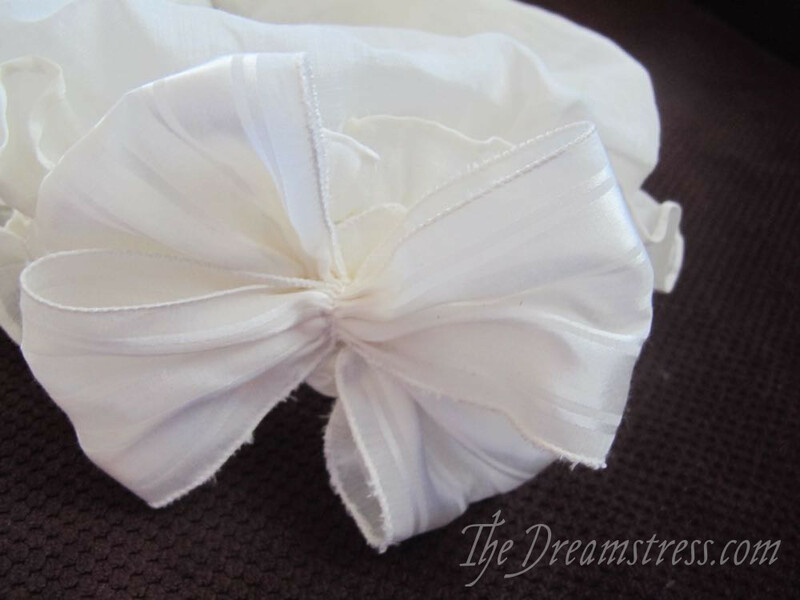 I love your white-on-white ribbon puffs and bow, It gives the cap a totally different look and I love that. 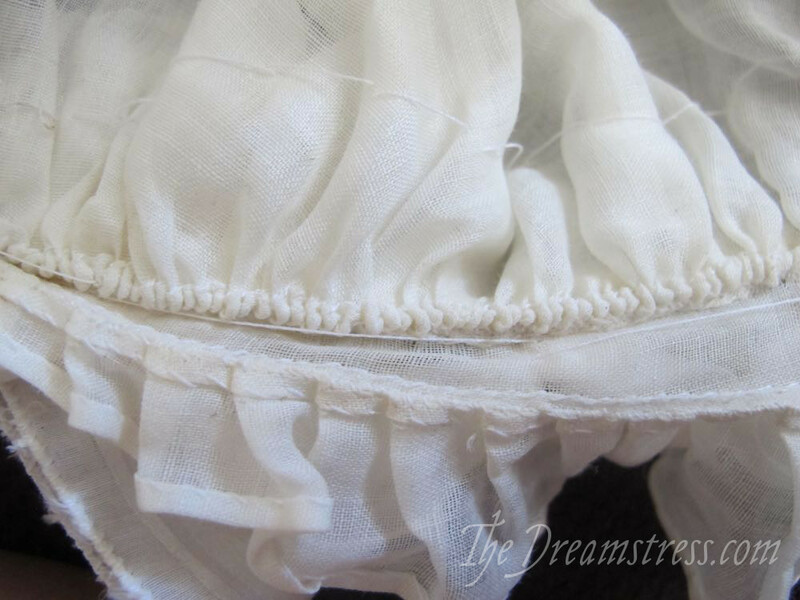 I am looking for such a fine white linen you used – can you give a hint were I can buy one? I got mine from The Fabric Store in NZ, but they only had one bolt. Burnley & Trowbridge in the US carries suitable stuff. Not sure where you’d get similar in Europe. I am in the middle of construction. Does the pattern include seam allowance? The band becomes nothing if turning in 1/8 then 1/8 on both edges. Same for the face ruffle. TIA. Hi Jere – you’d really have to ask American Duchess about the pattern. AD is very accessible on FB, Instagram, and through their website and blog. Wow, I am so glad I stumbled on this post – thank you Google! I was reading the directions yesterday and was so, so confused when it said to pleat the ruffle to match half the cap. It also didn’t say which part of the band to sew it to, and said “first” ruffle instead of “face” ruffle like the pattern piece is labeled. I was thinking maybe you needed two ruffles. So there is a little gap in the ruffles at center front since they are two pieces?